Dasara Festival is synonymous with arrangement of dolls in South India, particularly in Mysore (Karnataka), Tamil Nadu and Andhra Pradesh. During our travels in California a few years back, we found the below arrangement of dolls at a Hindu temple in San Diego. In the South Indian city of Mysore, Dasara is celebrated with great pomp over a 10-day period culminating in a grand procession. An idol of the Goddess Chamundeshwari is placed on a golden mantap atop a decorated elephant and taken in a procession through the major thoroughfares of the city on the last day. Other attractions of the Mysore Dasara include illumination of the Mysore Palace and an exhibition (initiated by by the Maharaja of Mysore Chamaraja Wodeyar X in 1880). 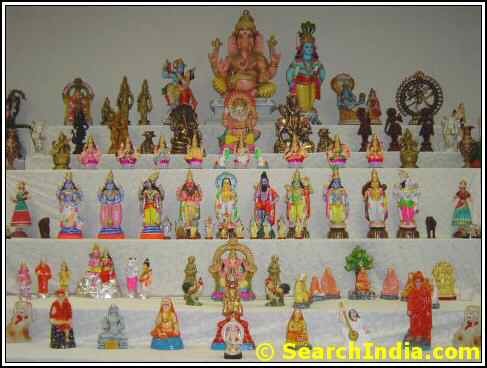 Dasara is also known as Dashera, Dussera and Dussehra.